The goals cascade is the nerve center of COBIT 5. It supports the identification of stakeholder needs and enterprise goals through the achievement of technical outcomes which, in turn, support the successful use of enabling processes and organizational structures (figure 1). COBIT 5, through the goals cascade and enabling processes for the governance and management of enterprise goals, recognizes that it is key for enterprise leaders to understand their business requirements for information systems. COBIT 5 emphasizes aligning IT initiatives with business (enterprise) requirements first before planning, organising and building a system that is being considered for acquisition. Aligning IT initiatives means that IT long- and short-term plans are focused on enabling achievement of business strategic and performance plans and creating enterprise sustainable competitive advantage. To build a system, enterprise leaders must have a clear understanding of the business drivers and outline specific enterprise user requirements for IT. Many organizations are quick to acquire before obtaining a clear understanding of the business drivers and user requirement specifications which leads to extensive budget and scope creep, fruitless and wasteful expenditures, inadequate utilization of IT-enabled investments, or, in some cases, total nonuse of the system. This is the leading reason why acquiring and implementing a system often fails. Organisations have a propensity to procure new systems without a clear understanding of enterprise strategic and performance goals or an understanding of enterprise processes. In most system procurement initiatives, there are no formalized business cases. In initiatives where there is a business case in place, often the details are scant, benefits realization accountability is not defined and benefits are not aligned to enterprise crown jewels, and the business does not have a clear understanding of its requirements. More often than not, new initiatives for IT-enabled investments are relegated to IT, and business leaders avoid getting involved. Business executives are not clear on what is required of them and how IT can enable them to achieve their business targets. IT does not understand business key drivers and the business case is a one-off document and is not regarded as a dynamic tool to enable benefits realization and track value creation from IT-enabled investments. In some initiatives, enterprise management is unwilling to drive implementation, leaving the vendors to implement a system that does not meet the expectations of the users, does not adhere to enterprisewide governance controls and does not meet enterprise strategic and performance goals. Often, enterprise management becomes involved and engaged with the system post implementation when it is more expensive to correct an issue than during the pre-implementation stage. By using the goals cascade, business leaders are able to align business investments enabled by IT to enterprise strategic and performance goals through a detailed understanding of enterprise stakeholders, stakeholder key drivers and enterprise goals. The first domain in the COBIT 5 management area, Align, Plan and Organize (APO), calls for enterprise management activities to be aligned to stakeholder needs and enterprise goals. Thus, the procurement of an IT-enabled investment must be aligned to stakeholder needs, which are represented by enterprise goals. Once enterprise/IT-enabled investments alignment is performed, business leaders need to define their specific business requirements for an IT-enabled investment. Business executives need to establish business drivers and explain why the enterprise should spend time and money on the investment. The justifications should be linked to specific enterprise strategic and performance requirements (i.e., build business specification requirements). After specifying business needs for an IT-enabled investment in a formalized business case—specifying costs and benefits, return on investment (ROI) and payback period—all information economics, benefits realisation accountabilities and value-creation timelines can then be implemented (Build, Acquire and Implement). It is important for IT enabled investments to follow established supply chain management principles, policies and frameworks. When drafting business cases for IT-enabled investments, it is important to avoid hiding behind non-quantifiable benefits or metrics. If you cannot measure it, you cannot manage it. Every benefit should have a direct relationship to key stakeholder needs and enterprise objectives. 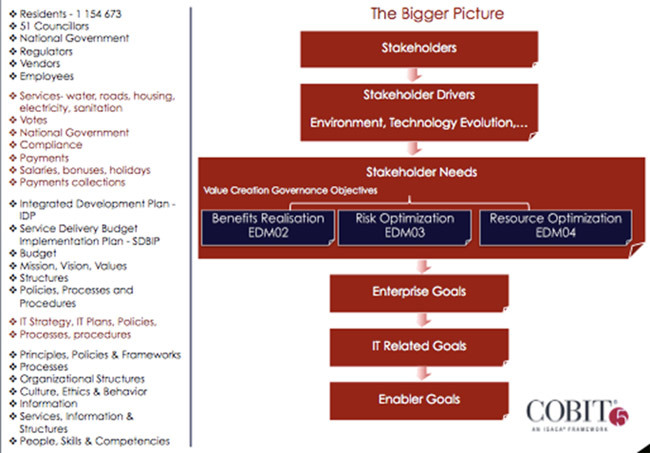 Using the COBIT 5 goals cascade ensures that IT-enabled investments procured meet enterprise goals, address stakeholder needs, enable benefits realization and ensure that the life cycle of the acquired investment is managed by continuously aligning IT-enabled investments to changing stakeholder requirements. An example using a local government municipality in South Africa is shown in figure 2. Local municipality stakeholders include, but are not limited to, residents, councillors, national government (the ruling party), regulators, vendors and employees. These stakeholders are driven by different factors. Residents are mainly driven by the requirement for good services in the form of clean water, roads, housing, electricity and sanitation. Councillors would normally be driven by delivering services and advocating for the interests of their political parties and residents. Employees deliver services to the residents and ensure that their welfare is looked after in the course of fulfilling their service delivery contractual obligations. In order to deliver on its enterprise goals (IDP and SDBIP), the municipality must adopt and adapt to IT. The IT department is an enabling function toward ensuring that the municipality governance and management practices and activities deliver on stakeholder needs. Thus, the IT strategy, business investments enabled by IT (IT projects), the annual performance plan, structures, processes and procedures should be directly focused on enabling the municipality to deliver stakeholder requirements.